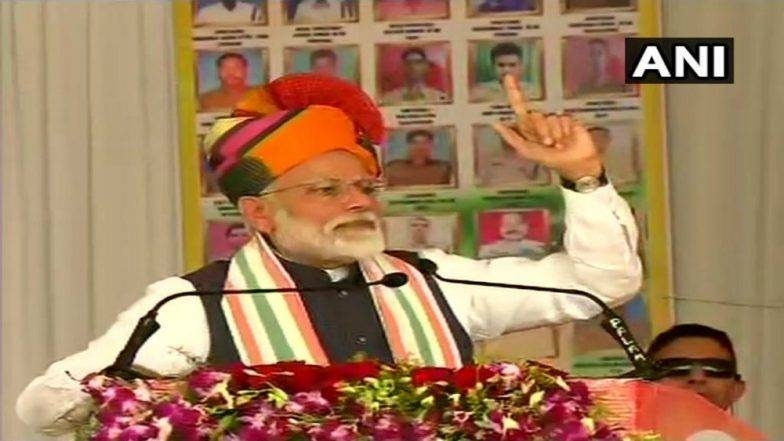 In first public remarks after strikes by the Indian Air Force across the Line of Control, Prime Minister Narendra Modi today said the country is in safe hands and that he will not let the country down. "Today is a day to pay homage to India's Bravehearts. I want to assure you that the country is in safe hands," he said at a public rally in Churu, Rajasthan. I appeal to you all to salute all our soldiers today... I assure you all that the country is in safe hands. Whatever happens, will not let the nation stop. The reason I am being able to work like this is because of your support, your trust. Let me tell you this, we are a government that thinks a group is bigger than an individual, and the nation is bigger than any group. It is very unfortunate that not a single farmer from Rajasthan and Churu has got any money. Do you know why? Because the state government has not even sent a list of the farmers. They are not cooperating with the Centre. Within the next 10 years Rs. 7.5 Lakh crore will be deposited in the accounts of farmers. They will not have to do anything for it. They will directly get a notification on their mobile phones, saying that they have received the amount. My government has made the impossible, possible. The state government must not hinder the Centre's support to farmers. India needs a strong government and I am sure that your vote this time will give us even more strength to carry on our work to take India to new heights.